Your blog entry based on your talk and trip to Nepal has left an impression on me. It has helped the participants in the conference and I believe will help the readers to unveil the fact ‘Writers teach, Teachers write’ that has still more to be materialized in our context. The teachers who teach writing are hardly writers in our context and this harsh reality is not unknown to you as you found this from the interaction during the meeting with the participants and the activity during your talk. Unless the teachers write, they cannot teach writing. I believe in your principle and would like to follow in my life too urging each teacher who teaches writing to become a writer so that the learners and others can be motivated and inspired by the ways he/she writes. Writing is something that depicts life. One can learn language easier when real life situation is created and writing has power to do that. I have seen some people who are not good at speaking but they write better. As writing is recorded, it has larger impact and has power to immortalise those who write. For example, greatest poet and dramatist William Shakespeare is known worldwide and is live through his writing even after his death and so is the greatest poet Laxmi Prasad Devkota in Nepal. Your writing entry into the blogzine will obviously inspire to write. Some suggestions and tips you have provided the readers what writers do and what most of them don’t. I found your suggestions similar to the ones which my mentors and gurus always provide. One of them says, he reviews and rewrites the same draft more than twenty times before he finalises. I frequently submit my draft for his inputs which I find very useful for refining and revising my writing to the final shape. Wow, the poem ‘whose language is this, English?’ I found is more interesting and it’s indeed awesome. Your poem will always remind me of our meeting and talk. 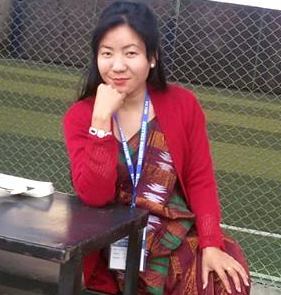 I hope to you will have the next visit to Nepal soon and regular writing to NeltaChoutari with a view to inspire Nepalese teachers to become writers through your wonderful ideas and creative power of your writing. Thank you for the reflective blog entry. But there are very few teachers who are writers but I WANT TO BE A GOOD TEACHER AS WELL AS A WRITER and will also encourage my friends to write if not for themselves then for their profession and for their learners whom they are going to teach. How can you teach guitar, if you can’t play guitar? How can you teach volleyball, if you don’t play volleyball? Of course you cannot, or at least you cannot do it very well.